The latest appearance -- if you can call it that -- of Samsung's next Galaxy phone seems to give further weight to the possibility that it'll be called the "Samsung Galaxy S3". The name has appeared today in Samsung's Kies PC software, which is used for synchronizing personal media to Samsung smartphones and tablets. The entry is found in a very specific place -- you'll need to go to "Samsung Apps", select "France" as your region and then track it down in the list of phones that appears. 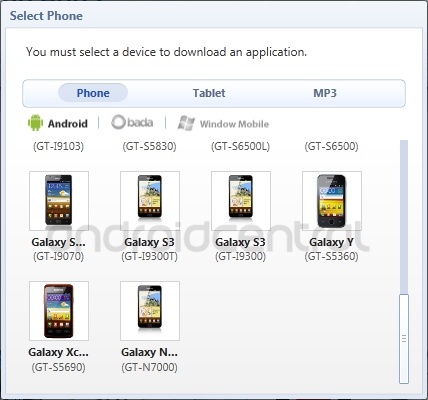 There appear to be two variants of the device -- GT-i9300 (which we're already familiar with) and GT-i9300T. Unfortunately, though, there's no way of telling what separates the two devices at this stage. Also, don't get too excited about the tiny thumbnail image up there, it's just a Galaxy Note (compare it to the Note image directly below). So it's looking increasingly likely that "Galaxy S3" is indeed the name. But however things play out at the May 3 announcement event, we'll be there to bring you full coverage. In the meantime, you can chat it up in the Galaxy S3 forums.